Motorman Carey B. 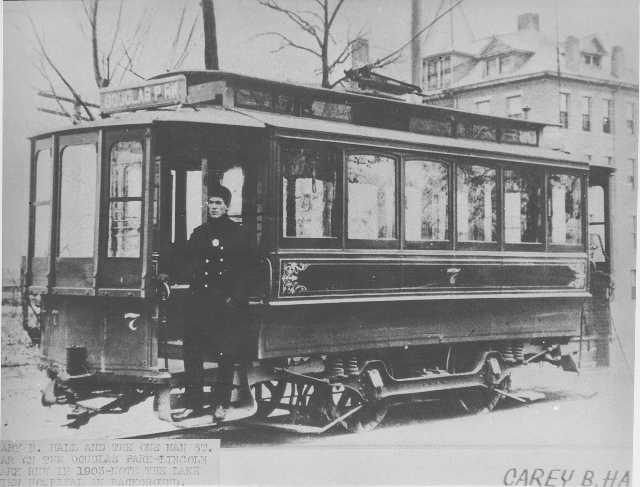 Hall poses with car 7 on the Douglas Park-Lincoln Park line in this 1903 photo. Lake View Hospital is in the background. The car has been changed a bit. Vestibule windows have been added above the front dash, giving the motorman some measure of protection against the cold winter. The route name is no longer painted on the car, but is displayed on a changeable sign on the vestibule roof, giving the system much more flexibility in car assignments.